-- Neurosurgeon Julia Nolan places cortical implants into the brains of field operatives to record data from their auditory and visual cortices. One of her subjects, an operative named Ian Westhelle, suffers a psychotic break and kills his handler before he can be recovered. Julia tracks Ian to an asylum where the CIA warehouses insane former soldiers, scientists, and others with security risks too great for conventional psychiatric wards. Agents from the national intelligence directorate discover her snooping and target her for elimination. 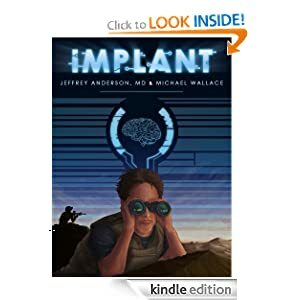 A collaboration between international bestselling authors Michael Wallace and Jeffrey Anderson, Implant is a heart-pounding thriller that will keep readers guessing until the final, chilling conclusion.